This room fan has a 45-watt motor with 3 speeds. Whisper quiet, you can choose between the LOW setting at 900 RMP, the MEDIUM setting at 1,100 RPM, or the HIGH at 1,280 RMP. All settings are quiet and won't distract you from your work or keep you awake at night. The smooth oscillating feature guarantees you'll remain comfortable even during the hottest days and nights. Made with high-quality stainless steel covered with an elegant finish. The fan's sleek design can enhance the look of any space. This stand up fan has an adjustable telescoping neck that allows you to adjust it between 37-49 inches tall for the perfect height across your bed, desk, sofa, or patio. The oscillating fan reaches a wide area across your room, office, gym, garage, bedroom, or kitchen. A tilting head allows you to control exactly where the cool air goes with a strong, direct wind or a softer, indirect breeze. DecoBREEZE is a leading home decor and fan company dedicated to making the best products for your home. We offer customer support ready to help with any questions or issues, either before or after becoming a valued customer. Please contact us - we're willing to help! 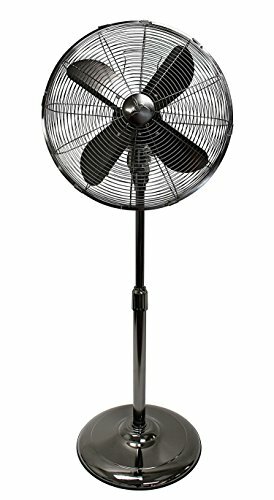 ADJUSTABLE AND FLEXIBLE OSCILLATING FAN: Telescoping neck allows you to adjust the fan height anywhere from 37-48 inches high. Oscillating fan head is 16" wide and tilts so you can cover a wide room for maximum cooling. 3 SPEEDS AND WHISPER QUIET: 45-watt motor packs a punch without distracting you from your work or waking you from a peaceful sleep. No buzzing, clicking, or vibrating. Low setting is 900 rpm, Medium is 1100 rpm, and High is 1280 rpm. Fan base is a stable 18" wide. OPTIMUM PERFORMANCE AND UNMATCHED ELEGANCE: This premier oscillating fan is constructed with high-quality brushed stainless steel. Sleek and shiny stainless steel construction with a timeless and elegant finish. PRODUCT DIMENSIONS: Package is 23.6 x 18.3 x 7 inches. Item weighs 16.08 pounds and is 48" tall and 18" wide. The fan head measures 16 inches. SATISFACTION GUARANTEE: Full satisfaction guarantee and a one-year warranty offered because we know you'll love it. If you have any questions about this product by Dynamic Collections, contact us by completing and submitting the form below. If you are looking for a specif part number, please include it with your message.